The Deveaux is a very private suite with an entrance from one of our patios and offers so many unique amenities that you won’t experience with other hotels in Taos. 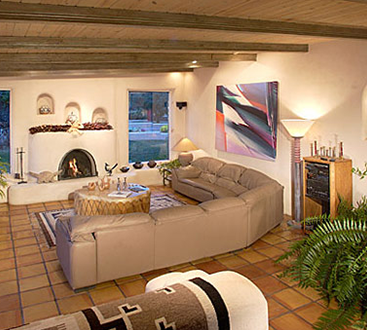 For instance, you can step into the sitting area and relax on a colored leather sofa in front of a kiva fireplace and saltillo tile floors, with viga and latilla ceilings overhead. 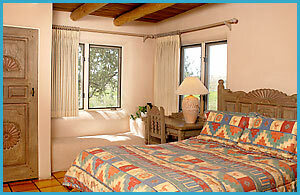 Look out the many windows and enjoy the view of Taos Mountain, the pasture, and mesa. On occasion, you may catch a glimpse of a coyote, a red tail hawk, or even a bald eagle. 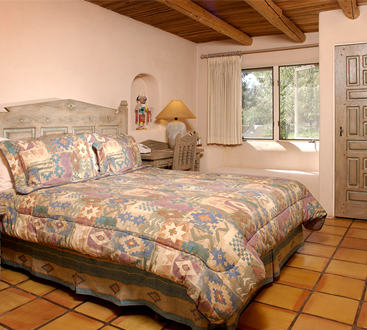 The suite also has beautiful hand carved furniture and a queen-size bed with a cozy down comforter, private bath, and television. 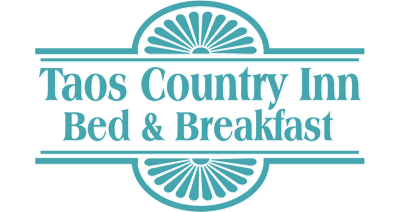 Don’t just settle for any Taos lodging — click below to book a room in our romantic bed and breakfast today!